With the help of Hollywood, bats throughout the years have given the wrong impression to the general public. Portrayed as blood suckers that only mean to harm people, these amazing creatures in actuality are vital and essential to protecting our ecosystems. With bats being one of the bug exterminators of the animal kingdom and with their help of pollinating the plant life, it’s clear how they affect our lives in many ways. How can this all be achieved though? What allows these animals to do so much? Nothing would be possible if it weren’t for the gift of flight. How bats fly is quite unique than those other animals that fly. For one, they are the only mammals known to man that are able to fly. Besides that, what is it about bats that makes their flying so special? It’s that their wings are shaped differently than others. Its clear to everyone that birds and bats are related. We know they both roam through the skies, have wings, and fly. However, did you know they are also closely related to humans? How so, you may ask. The secret to that lies in their wings. While birds have more of a rigid bone structure in their wings, bats have a more flexible wing allowing them to fly in different manners. 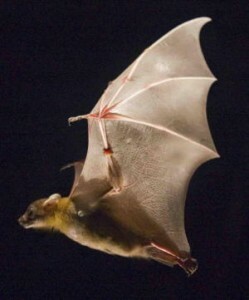 Equipped with over two dozen joints in their wings and with a thin membrane covering the wings, bats fly in a more “economical” manner than other fliers do. While birds and insects fold and rotate their wings during flight, bats have the option to do more in flight because of their complex wings (Brown University). Because of the extended membrane that covers the whole wing, bats are able to use their extra skin to their advantage. With the help of their flexible skin, bats are able to produce drag and lift in their own unique way. In class we have learned that the downstroke generates useful forces such as thrust and most of the lift, while the upstroke is complicated and diverse, correct? Well the bats just brought it to a whole ‘nother level. When bats are flying, these animals extend their wings out to their full potential when they are in downstoke. Why you may ask? They do this because since their extended membrane covers the wings, the elasticity of the skin catches more air, producing a greater lift in exchange for less energy. However, when bats are in upstroke, they contract their wings closer to their body than other flying animals, reducing the amount of drag they produce when they fly. However drag isn’t necessarily a bad thing is it? As many flying animals and objects try to avoid drag, bats have found a way to utilize it and apply it to their everyday lives. With the wings being mostly the extended membrane, the sensational flexibility of the wings allow the bats to turn on point. By harnessing the wind captured by the wings, the “drag”, bats are able to make 180-degree turns in a distance of less than half a wingspan (Brown University). Because of this distinct flying pattern, bats are able to fly for longer periods of times in a more energy efficient manner. I hadn’t seen that video. Excellent! I think in the video you see the bat “catching” an insect in mid-air with its flexible wing, then helping himself to a mouthful.